Indy 500 “Carb Day” Highlights …. INDIANAPOLIS – Carb Day got off to a blistering start with IndyCar teams getting in their last hour of practice before Sunday’s 500 mile race. Thirty-two cars hit the track with Dario Franchitti and Target Chip Ganassi teammate Scott Dixon running the quickest at 222.360 and 222.274 mph respectively. The only incident during practice was with the No. 64 Lotus-FP Journe-Fan Force United Car driven by Jean Alesi (R) with a front brake issue. Both right and left front carbon brakes were smoking profusely when Alesi pitted. Brake problems developing on the slowest car in the field do not bode well for Alesi, as he is likely to be mired in lap traffic for most of the day Sunday during the 500. 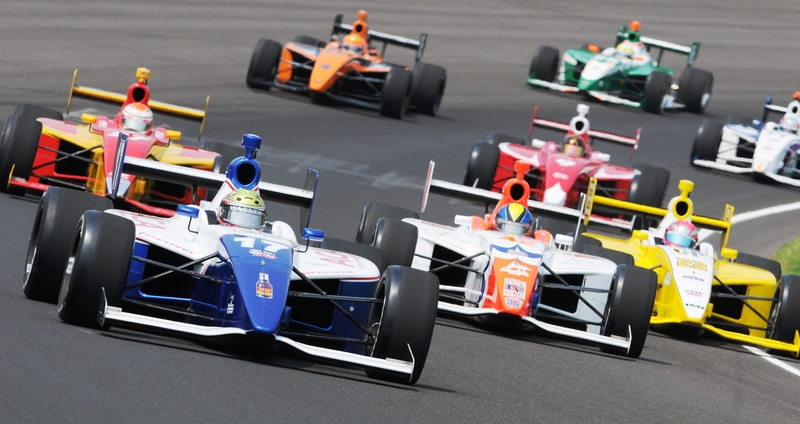 Following IndyCar practice, the Firestone Indy Lights Freedom 100 got off to an ominous start as several drivers expecting the green flag, were instead yellow-flagged, as cars had already begun passing each other before the field even made it to the start/finish line. Drivers showed little patience running four wide when the race finally went green. Driver judgment was dicey early on when on the seventh lap, Oliver Webb, moved down into the groove making contact with Brandon Wagner pushing both of them back up into the turn two wall, taking three other cars with them. The wreck also damaged the SAFER barrier, red flagging the race for 12 minutes. All drivers were unhurt, with three of them being checked and released by Speedway medical staff. Sensational racing ensued for the next 29 laps with lead changes involving four drivers: Victor Carbone, Tristan Vautier, Esteban Guerrieri and pole sitter Gustavo Yacaman. It was Guerrieri who made the most of a late pass on lap 38, while Jorge Goncalvez was going into a spin hitting the wall, bringing out the yellow flag to end the race. It was Guerrieri’s fifth career win, and the fourth consecutive Freedom 100 victory for Sam Schmidt Motorsports. In addition to Target Chip Ganassi Racing being the fastest in practice, Scott Dixon’s No. 9 team also won $50,000 by defeating Oriol Servia of Panther/Dreyer & Reinbold Racing in the Indy 500 Pit Stop Competition. 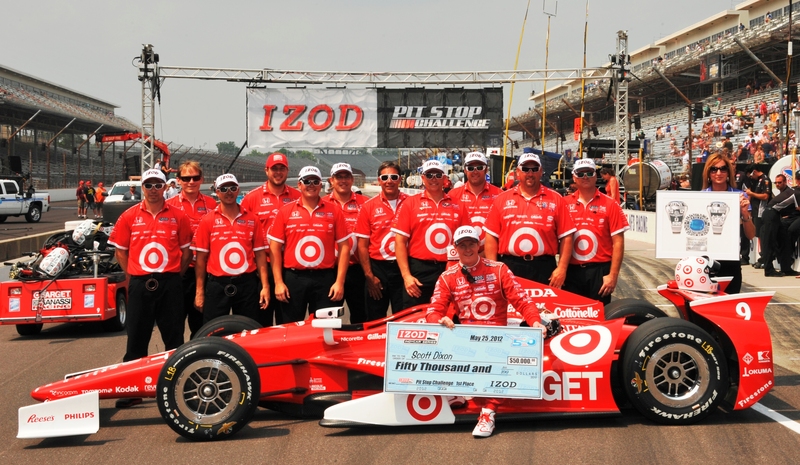 It was the first-ever win for Ganassi in the pit stop contest. In what could be a good omen for the Ganassi team, the winner of the competition has gone on to win the Indianapolis 500 six times.